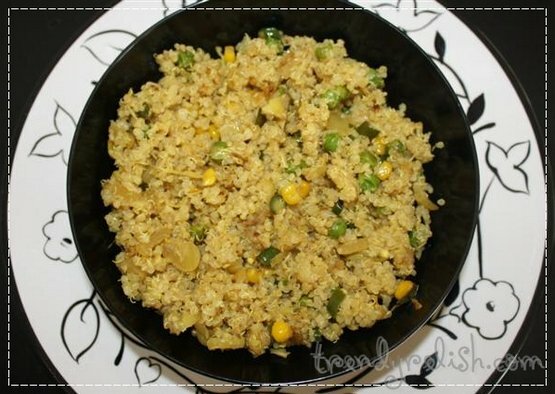 I did this yummy and healthy pulao replacing rice with quinoa. 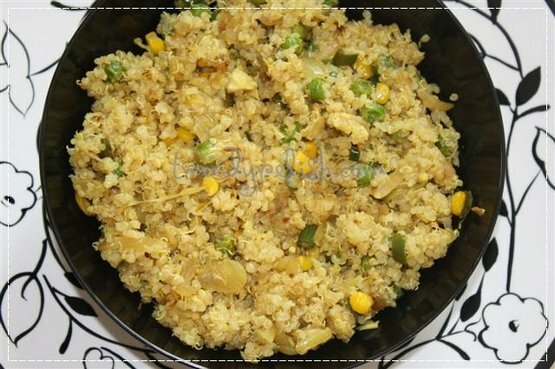 This pulao tasted so great with the addition of different spices and vegetables. Wash and place quinoa in a bowl, add 2 cups of water, cover and pressure cook until 3 whistles. Meanwhile, heat oil in a pan and add cumin seeds + curry leaves + cabbage + onion + green chilies + green peas + corn. Stir well and allow the veggies to cook well. Then add garam masala + turmeric and mix well. When the veggies are cooked well, add cooked quinoa and mix well. Add salt as needed, mix the contents well, cover and leave on low flame for 5 minutes. Finally mix well and turn the flame off. Transfer the pulao to a serving bowl. Enjoy this delicious and healthy pulao with raita or just plain yogurt. Super healthy and yummy pulao..
Amazing looking pulao. Delicious preparation. very inviting pulao , healthy too ! !